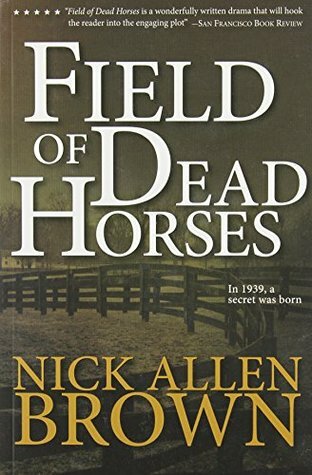 Field of Dead Horses is a great easy read that keeps your attention throughout with a great story line. With a great ending I would recommend this book to anyone. I liked it, I could visualize the farm and the people good descriptions. Learned a little about training horses. I enjoyed the characters in the story and would even visit Georgetown Kentucky. I know this book was popular a few years ago, but I was too busy reading other books that I wasn't able to read it until now. I read it in one sitting, so needless to say I really liked it.Earlier this year I picked it up at a local used book store, while the cover was a tiny bit worn, it'd never been read. It's autographed to "Kirk, so glad you enjoyed the book" " and has a label inside " One Book, One community, Shelby County (I'll assume Ohio) Public Library 20015. Enjoyed the book once I got past all the details. Some like details but I like the meat of the story which came and conquered. Great characters, storyline and ending. another must read by Nick Allen Brown.. Can't wait for his next book. This was a fairly quick read and I enjoyed it. The details of training race horses was very interesting. The ending didn't surprise me. I suspected who the guilty party was. This book was awesome. Once I got started, it was hard to put down and I couldn't wait to get to the next chapter. It was a real life story with wonderful characters and some sad and heart breaking situations. It's not often that I tell my husband the details of a book I'm reading but with this one I did and at the same time, I was enjoying the story a second time.I met Nick Brown at a book signing and I asked him questions about the book. It sounded good then and he did not disappoint. I can't believe this is his first book and I am anticipating many more. Saw book display at Costco and approached. There was Nick Brown, it was a book signing. Surprise! Very nice man and interesting to talk to. Said he would discuss book with book clubs via skype. Not in a book club, but liked his attitude, so bought the book. My mother-in-law, husband and I all read the book and throughly enjoyed it. He has another coming out soon (I believe). I will look for it. I bought this book at Barnes and Noble as part of my book club. I wasn't too intrigued by the title but when I finished it, I found myself looking at what the other books the author wrote. I found out that this is the authors first and I couldn't believe it. This is more like a 10th or 15th book. The book club I am a part of loved this book and I mean everyone. Wish they could all be like this. Most of the time we read sappy romance books or strange thrillers. This one took us all by surprise. Really nice book. A little too predictable but I enjoyed the setting (Kentucky), loved the horses and the action at Keeneland. The "secret" is WAY too easy to figure out - like you figure it out pretty much at the beginning of the book. Nice try though. If you enjoy a simpler time and place this is a very pleasant read. Our book club selection month and we loved the book! There is a strong development of characters set in the 1930's era involving a love story and the horse racing culture. A must read! Nick Allen Brown was kind enough to call and discuss the book with us during our meeting. Can't wait for his next book. I enjoyed this book tremendously! The author has the gift of allowing you to see the the characters, smell and taste the home cooked meals and hear the horses go around the track. I felt like I was watching the movie in my head and typecasting actors for each role! Reese Witherspoon and Ryan Gosling are my front runners! I look forward to reading more books from this author! As a Kentuckian and avid horse lover, this book caught my eye during one of Nick's recent signings. I knew I would love it from the synopsis on the back cover and I was right! I would definitely recommend this book if you like a story with a "twist"! Great job, Nick! I will definitely be looking for more of your work. It is a great read and perfect for entertainment while on vacation or just to pass the time. This book is from a first time author, but you'd never know it. He crafts his story so well it keeps you turning page after page. I'd recommend this to anyone; I loved it! I loved this book. It held my attention from the beginning to the end. It is not like any of the books I normally read but am so glad I met the author and he talked me into buying his book! He promised me that I would not be disappointed and he was right! Liked this book - didn't love it. Liked the Kentucky setting and thought it was interesting to read about the training of race horses and how trainers are chosen. I thought the mystery of the story could have been developed more. I was surprised at the ending. Again, I wish they gave us half stars. I'd go 4.5!Great book. The character development was very good. I Loved the horses and the families love and training of these Kentucky race horses. Well done! I'll read this author again!! Great book for a first time author! Easy read, good read. Takes place in Kentucky where the author is from. Love his descriptions. Like the authors voice, I loved the Georgetown ky setting. Outstanding debut book - a mystery with depth and poignancy. Highly recommend it! Good story. It read like an old Western, in a good way. It would be good for young readers because it has no inappropriate content. Wonderfully rich story that captures your interest and holds you till the last page. Don't bother. Seriously the worst rendering of a story that supposedly based on an actual event. No doubt it will show up soon on the silver screen, and probably be much better than the book. Surprisingly well written for a first novel, with a heart-warming twist at the end. I would read another by Nick Allen Brown. I've read a lot of mysteries, and this one surprised me. I liked the story being told against the backdrop of a racing barn. It combined two of my hobbies, horses and mysteries. Absolutely wonderful. A little out of the genre of my typical reads, but this was awesome. Wish it was part of a series so that I could read more. A fascinating tale and inside look at horse training and racing in our beloved Kentucky. Romance, murder and nostalgia added make the perfect read! Loved it! Wonderful Kentucky fiction!